It’s rare to come across a resource online for English teachers which is unique and empowering, but Off2Class is that rare thing. Off2Class provides high quality content for teachers who want to work online or in the classroom with digital materials. Off2Class is a toolkit for ESL teachers. We combine teacher-led ESL learning content with a student management system. Part content, part software, 100% built for ESL teachers. We started by working with freelance ESL teachers tutoring both online and in-person. We’re now also working with classroom ESL teachers and languages institutes. We love working with both user types bu t my personal favourite are our freelance teacher users. There is a ‘can do’ attitude that a lot of freelance ESL teachers possess making them fun customers to work with! Why did you build Off2Class? 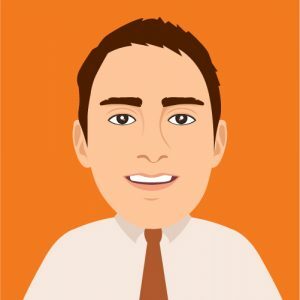 My business partner, James Heywood, had ventured into online ESL teaching and was frustrated that there was a lack of high-quality, teacher-led ESL content that was properly animated for an online classroom. We soon realized that it wasn’t just online ESL teachers that were frustrated, but lots of teachers were now teaching on screens and were finding it hard to access ESL content that was suitable for these new environments. How many lessons do you have in Off2Class? Our ESL Lesson Plan Library contains over 500 lessons and we add to the library every month. Our latest additions include our Listening Activities (which contain audio recordings of graded, authentic native English) and our Business English series. Is there a particular pedagogical paradigm or learning theory on which the lessons are based? Our philosophy has always been to complement ESL teachers. Our lessons are designed to be teacher-led (i.e. taught and adapted live) and follow the communicative approach. We’ve paired our content with some powerful annotation tools and an online whiteboard that teachers can use to build on our lessons as they teach. Do you suggest a specific pathway through the materials? We recommend that teachers have their students sit our ESL placement test. For every student that sits the test, we will produce their gap analysis and individual learning plan which outlines a pathway to target their language challenges and fossilized errors using our materials. 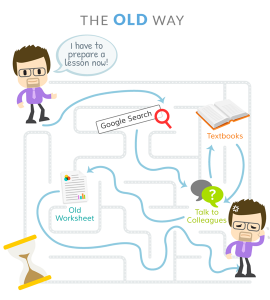 Can teachers author their own lessons or customise the lessons in Off2Class? Coming very soon! We’re in final testing of our lesson editor which will allow teachers to customize our lessons. We realize that every student is different and that teachers know their students best. We’re excited to release this next stage of customization! Off2Class looks very much like a product aimed at teachers, so how have catered to what students need? We believe that for meaningful secondary language acquisition (for 90% of learners) students require a teacher. There just aren’t that many students out there that can maintain enough motivation to learn a language entirely through self-study. By supplying teachers with the right, adaptive resources to guide their students through the language acquisition journey, we believe that we will be catering to what students need. 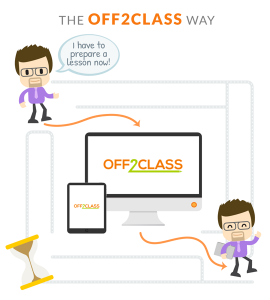 Does Off2Class work on mobile devices such as tablets? Absolutely, we work on any device or screen. We’ve gone to great lengths to make sure we can cater to any digital learning environment. Students can access their learning portals on any internet-connected device including mobiles and tablets. For online lessons we integrate with all major videoconferencing systems and for classroom teaching we are projected using IWBs, TV screens or projectors. We have many teachers that frequently use Off2Class in different environments, e.g. one day for an in-person tutorial on a tablet and the next day for a classroom session on a projector. Do you use the data from Off2Class to improve or rework your materials? Yes, we are constantly updating our content based on teacher feedback. Teachers can leave us feedback from within the lesson content itself. There’s a big ‘Give Us Feedback’ button at the bottom of our classroom which means teachers can give us commentary right when they think of it but without having to disrupt a lesson. 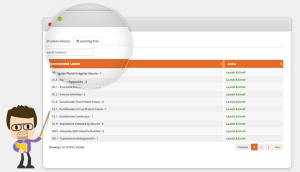 We also prioritize our content releases based on data showing us which lessons are being used the most. How do you plan to develop Off2Class in the future? We’ve recently taken steps to increase the level of customization features on Off2Class and the teacher feedback has been tremendous. So most of our plans for development will follow this course – increasing opportunities for teachers to customize Off2Class so it better matches their own teaching style and preferences. Kris is in charge of customer satisfaction for Off2Class. In this role he gets to work with a variety of ESL educators teaching in both freelance and classroom environments. Kris launched Off2Class with his business partner James Heywood, who was frustrated that he couldn’t find any good, teacher-led digital content for his online and in-person ESL tutorials.